Hello ... Hello ... my old friends ... It's great to see you once again! 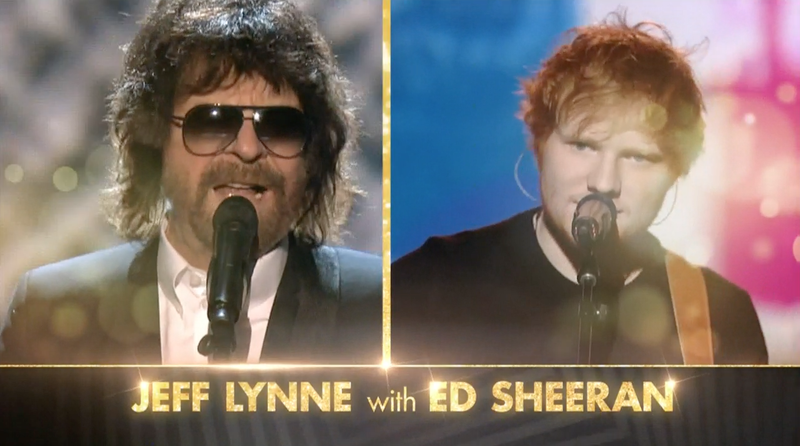 A second tip from a credible source yesterday afternoon that Jeff Lynne is set to appear with Ed Sheeran at the 57th Grammy Awards Ceremony on Sunday 8th February was enough motivation for Yours Truly KJS to place the above post on Facebook [and below, Twitter] yesterday following the broadcast of a trailer promoting the telecast during the CBS Sunday Morning Show. Our friends over at A JEFF LYNNE AND RELATED BLOG posted a screen shot [see above] of that trailer in this article earlier today further reinforcing this interesting news. It will certainly make the show unusually interesting to watch for fans of ELO & Jeff Lynne. Perhaps Jeff and Ed could perform "Stay With Me", the Sam Smith song that has now also been 12.5% attributed to both Tom Petty and Jeff Lynne due to its similarity with their 1989 "Full Moon Fever" collaboration "I Won't Back Down", apparently as a result of this recent out of court settlement? Brill. Wonder what they'll sing? So excited to hear about this musical collaboration! Two wonderfully talented Souls. I wouldn't miss this this Grammy performance for the world!